Arrive with an empty stomach and an inquisitive mind for this 3-hour murder mystery dining experience in London! Step into the role of everyone’s favourite detective, Sherlock Holmes, as you piece together the clues and solve a murder mystery while tucking into a delicious 3-course meal. 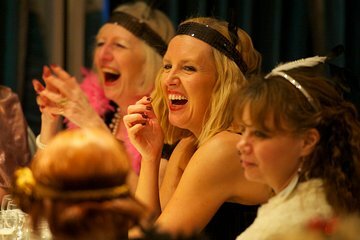 With an original Whodunnit to solve, costumed actors to bring it to life and plenty of classic comedy moments, it’s sure to be a memorable evening! Work together to solve the clues and find out who’s guilty! The listed price does not include parking fees, payable at the time of tour check-in. This is the very best Ive been to! So funny! I laughted and laughed. The actors were superb! The meal was delicious. It is a must to go to! I wish they were here in my home town! This was so much fun! Every member of the audience eventually became involved in some way. You are encouraged to come wearing clothing from the 1920s, which made it even more fun. It was also an exercise in sleuthing, so be prepared to figure out not just who committed the murder, but why. What a great night of entertainment. The actors were excellent and trying to figure out who done it was very enterainting. They do engage with the audience and fun was had by all. Highly recommend it for an evening out. This was so much fun! I attended with my boyfriend and his parents, while we visited London. We dressed up in 1920s fashion, too! The mystery was easy to solve but so fun to watch and be a part of. The food was amazing! Entertaining, a lovely way to spend an evening. My only complaints are that I wish the actors would've stayed after for pictures, and I wish the people who brought the food could've taken drink orders. We wanted to purchase alcohol, but once inside the room you really couldn't leave to the bar. Not the back half of the room anyways...it was too hard to make everyone at the table move just so you could go get a drink. A few drams of whiskey would've made this a 5 star rating! I hope you enjoy it too!